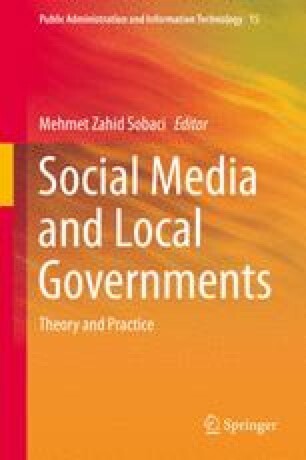 The objective of this chapter is to undertake a critical examination of social media usage by local or municipal governments in Canada in terms of both presence and purpose. By presence, we mean the existence of social media channels linking municipal actors (administrative and political) to their local citizenry. By purpose, we mean the objectives sought by municipal actors in leveraging social media as either an informational and communications tool on the one hand, or as a platform for consultation and engagement on the other hand, or some combination of both. Based upon a wider review of social media government practices in Canada and a specific examination of four municipalities, we, therefore, seek to respond to the following key questions: (1) to what extent are local and predominantly urban governments in Canada making use of social media; (2) what is the balance between providing information and communications vs. seeking more interactive and collaborative forms of public engagement (and how is this balance reflected in both municipal intent and actual public participation); (3) what is the balance between administrative and political actors in social media deployment and public participation; and (4) what are the most significant and identifiable opportunities and challenges for municipalities in both widening and improving public engagement capacities through social media?